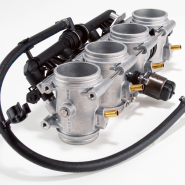 Today, fuel injection systems are not only the technical standard in automobiles, but also used in motorcycles. BING produces the BING throttle valve neck for the measured air supply of these systems, e.g. for BMW and Aprilia motorcycles.